2018 Note: I got so sentimental reading this post! I loved making baby food for my kids. I wish I could still make it ahead and freeze it in ice cube trays. I do still utilize the crock pot often. Just last Saturday, I had a sweet potato chili in one crockpot and queso in another for basketball/football Saturday. And I loved looking back at my blog intentions 5+ years ago. I had a list a mile long of all of the things I was going to do on my maternity leave. I am back to work now and the list remains. Sigh. But you must approach all such lists in the same way – one thing at a time. So, I really want to commit to recording recipes in this blog. The little bit I have done has been so useful to keep track of recipes we like and what went right and what went wrong to improve the recipe for next time. I have at least half a dozen draft posts I will finish but it seems only appropriate to just start today. So, here’s a quick recap of some recipes from this weekend. 1. Trim ends off green beans. Steam for 10 minutes. 2. Place 1 cup quinoa and 2 cups of water in a saucepan and bring to a boil. Reduce to a simmer, cover and cook until all of the water is absorbed. 3. Combine the green beans and the cooked quinoa in the food processor and process to desired consistency. Place all ingredients in pan. Cover and bring to a boil. Reduce heat and simmer for about 1 hour. Puree or mash to desired consistency. I love lentils, so I also made myself some lentils while the baby mash was cooking. This time, I just cooked the lentils with water, but I usually use a combination of vegetable broth and water. Add some diced carrots, onion and garlic. Add pepper to taste. Serve with a salad or rice. Now, onto the Super Bowl party. We finished our basement over the holidays to add some home office space and a bar where VeggieDaddy can serve his Homebrew. 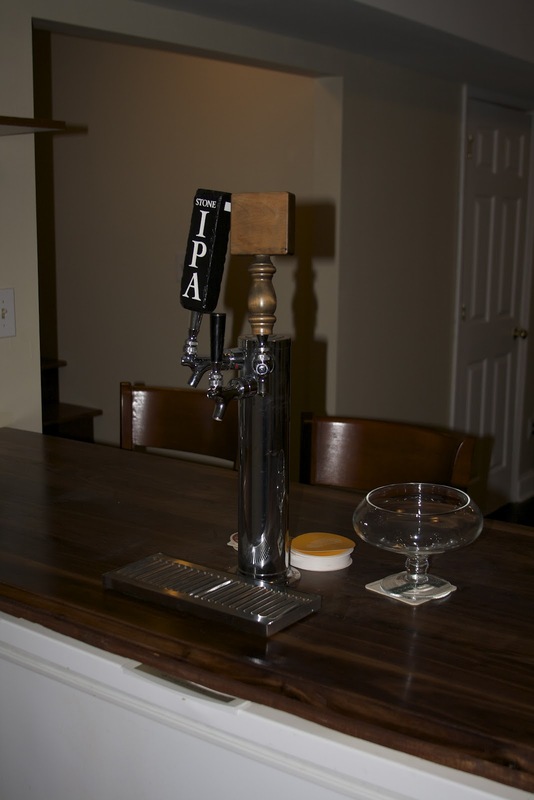 We decided that the Super Bowl would be a great time to unveil the new bar to our friends (and their 17 children!). We just made chili, a football-shaped cheese ball, and threw in some frozen pizzas. The guests brought appetizers and desserts, which included some tasty little cheese buns, baked brie, artichoke and spinach dip, king cake, cheesecake frosted brownies and cookies, among other tasty treats. It was a great spread! I cooked this in the crockpot all day, but you can make it in a large pot on the stove as well. This makes ALOT. 1. Set crockpot on high and allow to heat. Saute onions with about 1 tablespoon of olive oil until translucent. 2. Add sweet potatoes and allow to cook while preparing the beans. 3. Open all of the cans of beans and dump into a colander. Rinse and drain well. 4. Add the tomatoes, beans and all remaining ingredients and stir. If you use a crockpot with a timer, set it to 8 hours on low. Since I was home, I cooked it on high for a few hours because there was so much to cook, it needed the high heat to get going. This is from the Parents Magazine February 2012 Issue. This is super cute and the girls had fun helping me make it. 1. Combine cheeses and chickpeas in a food processor and blend until smoothe, stopping to scrape down the sides a few times. Add the red peppers and pulse until just combined throughout. 2. Spoon mixture into a shallow dish and spread. Chill in the refrigerator for at least 1 hour. 3. Crush the pretzels into crumbs either in the food processor or by placing in a ziploc bags and crushing with a rolling pin. Spread the crumbs on a piece of wax paper. 4. Scoop the cheese out of the dish and form into a football shape with your hands. 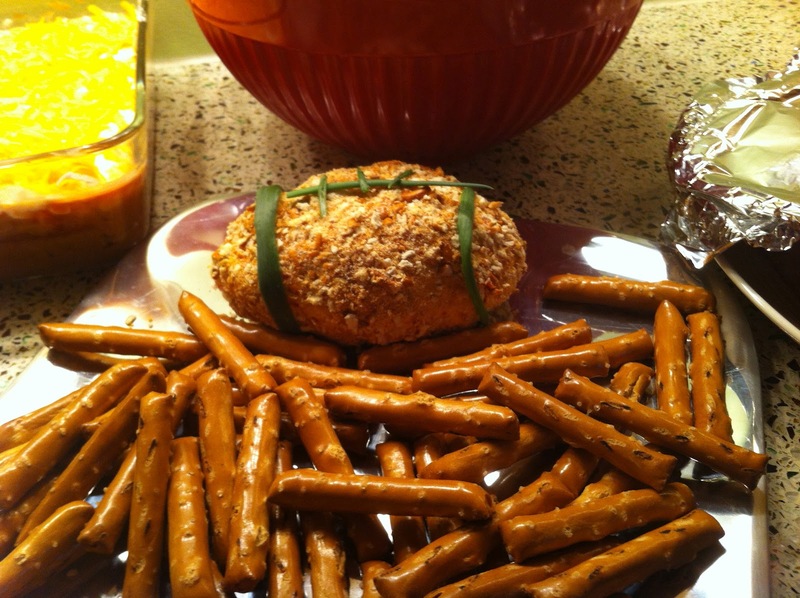 Roll it around in the pretzel crumbs to coat. Transfer to a serving plate and use the chives or green onions to make the laces. With the chickpeas, this is much healthier than your usual cheese ball, and it holds its shape much better! And on tap we had VeggieDaddy’s Mocha Stout, a friend’s Scottish Pale Ale, and Green Flash West Coast IPA. And, with that, I will sign off for now with the pledge to post at least a few more times this week.